Which Of These Cities, Due To How Many Hawaiians Visit It, Is Called The Ninth Island? Which Game Console Came To Market Only Because Nintendo Rejected It? Hawaii is a tropical archipelago of islands with eight classified as major islands. In order of geographical size, the major islands are: Hawai’i, Maui, O’ahu, Kaua’i, Moloka’i, Lāna’i, Ni’ihau, and Kaho’olawe. But if you ask about the ninth island, Hawaiians will happily tell you about a getaway that’s a bit less tropical and a lot more desert-like: Las Vegas. Why do the islanders refer to Las Vegas, a land-locked city in the middle of a desert approximately 2,700 miles (4,320 kilometers) northeast of their home as the ninth island? You can thank Sam Boyd. 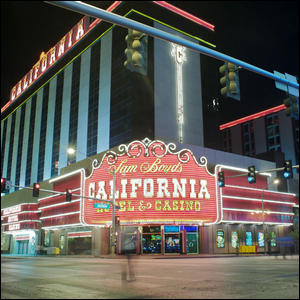 Back in the mid-1970s, Sam Boyd opened the California Hotel and Casino off-Strip in an aging downtown. Rather than attempt to rustle up strictly local clientele and knowing he was competing against a bevy of other casinos, he opted to import them. Boyd advertised heavily in Hawaii—an area he was already familiar with thanks to previous visits and where he knew there was a ready supply of people interested in gambling, but unable to legally do so because of local laws—and stocked his casino with foods and drinks popular on the islands, as well as dealers dressed less formally and with more relaxed attitudes around customers. Not only did his initial bid to draw in Hawaiian tourists work, but it has continued to work over time. He later set up a travel company with subsidized flights that paired dirt cheap airfare with stays at his casinos (so cheap that Hawaiians can catch a flight to Las Vegas cheaper than they can fly to another island in the chain). That not only made Las Vegas a go-to vacation spot for Hawaiians (the state has a population of approximately 1.4 million people, but around 260,000 travelers fly to Las Vegas every year), but it also enticed some of them to stay. If you wanted to move to the mainland with a lower cost of living (and compared to Honolulu, Las Vegas is a pretty inexpensive place to live), you could hop a flight, enjoy a week at a casino, and forge out onto the mainland. Over time, tens of thousands of Hawaiians made a one way jump, many of them starting local businesses in the process. The end result is that not only do Hawaiians visit Las Vegas by the thousands every year, but many of them have friends and family that live on the mainland full-time now, creating a pocket of Hawaii in the desert—a landlocked ninth island. Image courtesy of Gribiche/Wikimedia Commons.